A brief writing activity to help students express gratitude towards someone who has helped them during a difficult time in their lives. This is a great Holiday writing activity. It also works well during teacher appreciation week or for outgoing seniors! 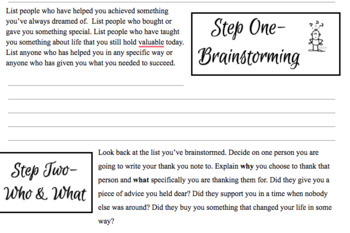 This worksheet provides an outline for students to generate a thoughtful and specific thank you note. It provides writing stems to get them started. I have used it in class and my students love delivering the letters that they have written. It's a great way to bring some positive energy to your classroom and school. This is available as a Microsoft Word Doc, so it is fully editable! Make changes as needed!